The deer tick is found in grassy areas, open fields, and especially the margin where fields meet wooded areas. 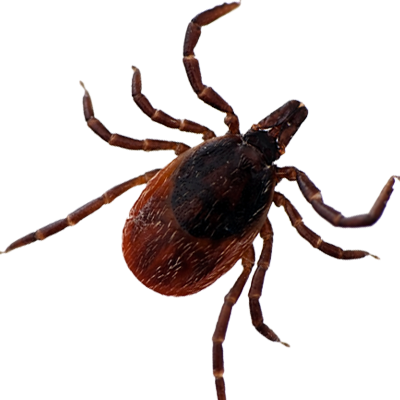 The deer tick transmits a bacteria which causes Lyme disease, a serious human disease that exhibits symptoms common to many other diseases. It is initially flu-like but if not treated can develop into rheumatoid arthritis-type conditions. Lyme disease is not usually fatal but can be debilitating and difficult to treat if not detected early.Adult deer ticks are tiny–approximately the size of a sesame seed. Males are black; females have a brick-red abdomen and a black shield near the head. Females swell to 1/4 mm when fully engorged after feeding. Adults are found primarily from September through November, and again in March and April. Adults feed mainly on deer, but will also attack cattle, horses, dogs, etc. Humans are accidental hosts.